Weekly studio art and music classes will prepare students for their degree programs at UArts, including practice in communication strategies for studio and performance environments, critiques and juries. Field trips, social activities and participation in UArts’ cultural events will immerse students in the contemporary arts culture at the University and in Philadelphia. Intensive English classes will develop students’ speaking, listening, reading, and writing skills and prepare them for college-level work. If you have been admitted to the University of the Arts conditionally, completing Level 9 in our ESL Institute will fulfill your UArts ESL requirement for matriculation as a degree candidate. Placement in the most appropriate English level is determined by TOEFL scores submitted with UArts application and/or by placement testing upon arrival to the UArts ESL Institute. Develop academic, personal, and creative writing skills through daily journaling. Have the ability to identify and revise (with some assistance) grammatical errors (Level I)/ with the goal of no more than three grammatical errors per page (Level II,III). 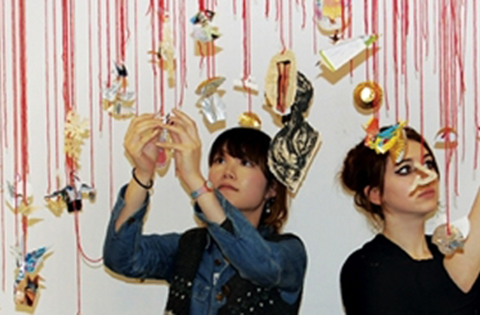 Describe, explain and analyze students’ own and peers’ art and music pieces through peer presentation evaluations. Apply vocabulary and linguistic functions by writing and performing skits. Skits for Level 1 are shorter and contain simpler vocabulary and syntax. Synthesize oral, reading, and presentation skills. English proficiency and analytical complexity will vary based on level. Develop research skills as they relate to local cultural events. Utilize planning and time management skills to organize students’ weekly cultural events. Students are responsible for finding, scheduling and attending events. Increase knowledge of and engagement with Philadelphia’s art, music, and culture scene. Evaluations through quizzes and blog entries. Reflect on and review cultural events through assessed presentations and in-class discussion English proficiency and analytical complexity will vary based on level. Apply conversation techniques to social and academic situations through classroom practice and evaluations. Engage in active oral communication with peers inside classroom, as well as outside of the classroom as measured by conversation with peer tutors and performing daily tasks. Become familiar with American social norms, particularly as they relate to conversational speaking through peer dialogue practice in the classroom. Level 1 – proficiency in survival skills such as shopping, banking, navigating the academic and home environment, and discussing hobbies, interests and goals. Level 2, 3 – all of the above, as well as communicating with university faculty and staff, American classmates/roommates, expressing more sophisticated opinions about hobbies, interests and goals. Practice US college-level studio environment norms through engaging in painting, drawing and photography, or for musicians, participating in instrumental activities and critiques. Practice communication strategies specific to the studio setting, art critiques, and juries. Practice objective vs. subjective communication strategies and question/answer techniques. Develop basic skills in using Apple MacBook digital tools and software for studio and Critical Studies projects through creating a multi-media presentation. English proficiency and analytical complexity will vary based on level. Upon ESLI completion, all undergraduate students will have achieved a High Intermediate level of proficiency, and graduate students will have achieved a Low Advanced level of proficiency. Students who wish to matriculate into an undergraduate level are required to pass all the ESLI classes (Reading and Vocabulary, Presentation, Writing and Grammar, and Conversation classes) and achieve a High Intermediate English language proficiency Level on the ESLI Exit Exam. Students who wish to matriculate into a master’s degree program are required to pass all the ESLI classes through ESLI level 9 and achieve a Low Advanced English language proficiency level on the ESLI Exit Exam.